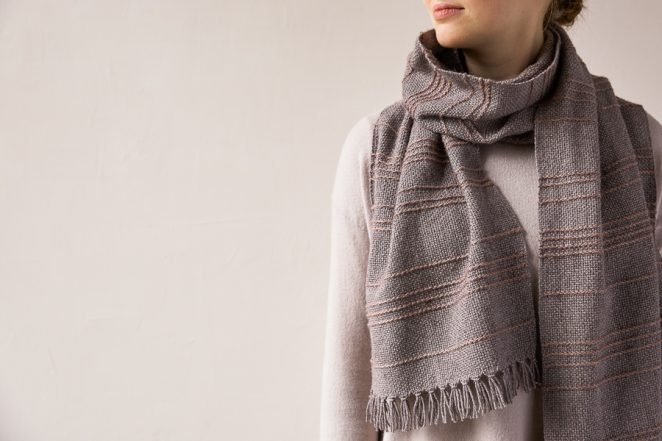 Like all fiber arts, weaving is a dive into antiquity, but our Soumak Weave Scarf pinpoints your time travel to Anatolia circa the 7th century BC, the birthplace of the soumak technique. Used then (and now!) 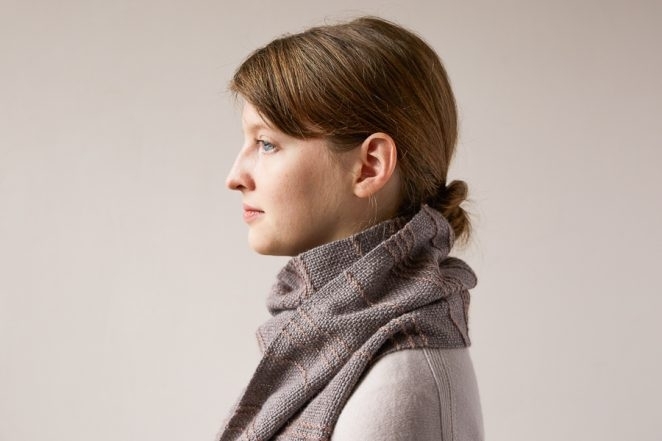 to create things like sturdy rugs and saddlebags, here we use it to form rows of raised twisted stitches that flow across the width of this beautiful and timeless scarf! 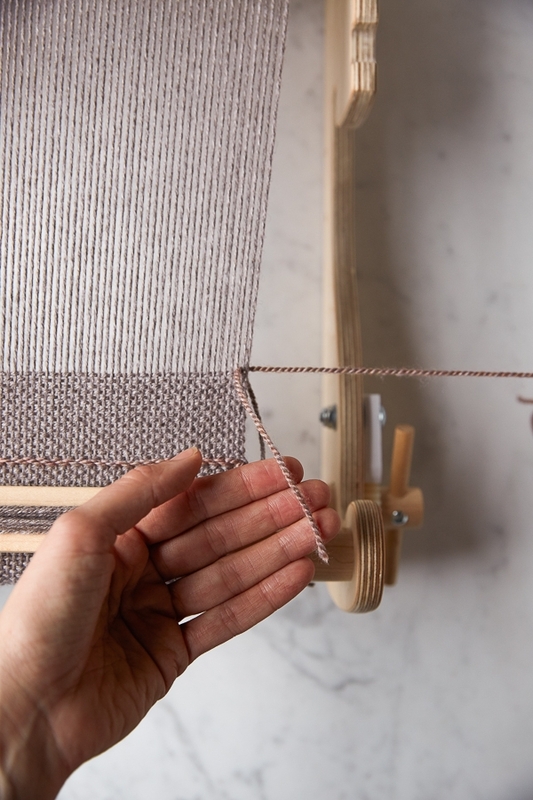 You’ll breeze through the plain weave sections on our favorite table-size Cricket Loom from Schacht Spindle Co. And for the single soumak rows, you’ll use a tapestry needle (called a sou in ancient Persian) to make little half hitches across the row, moving forward four warp threads and back two. But don’t worry, we explain it all in the pattern below! 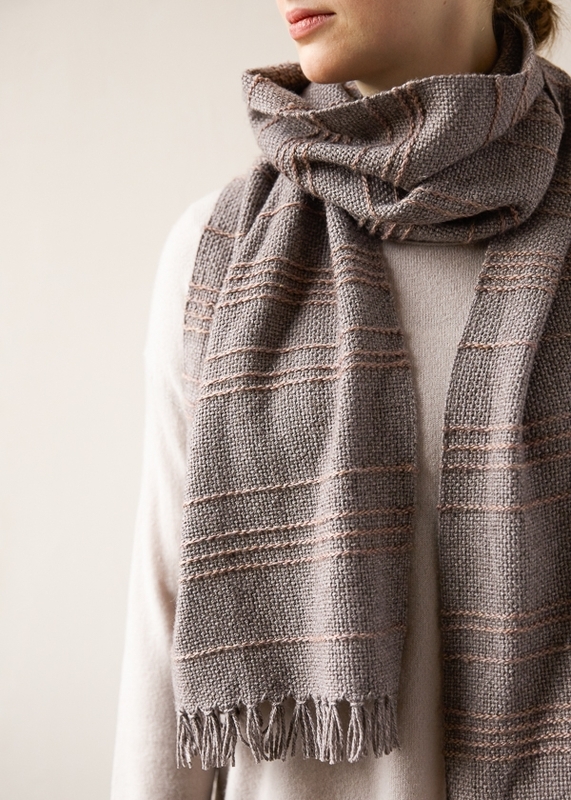 For the main yarn of our Soumak Weave Scarf, we chose our Understory, a super soft and squishy mixture of baby alpaca, baby yak, and silk. And for the rows of soumak weave, we used Mulberry Merino, whose shiny silk component makes a very nice contrast to Understory’s earthiness. 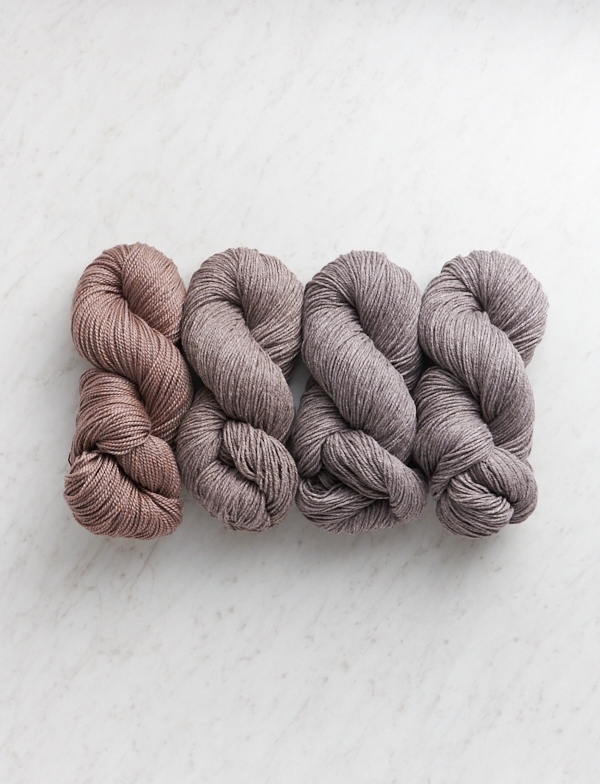 All you need in order to weave your own Soumak Weave Scarf: three skeins of Understory and one of Mulberry Merino. 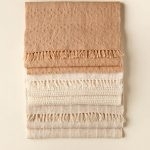 We’ve selected three soft, neutral palettes for inspiration, so prepare to hit warp speed for your travel back in time! 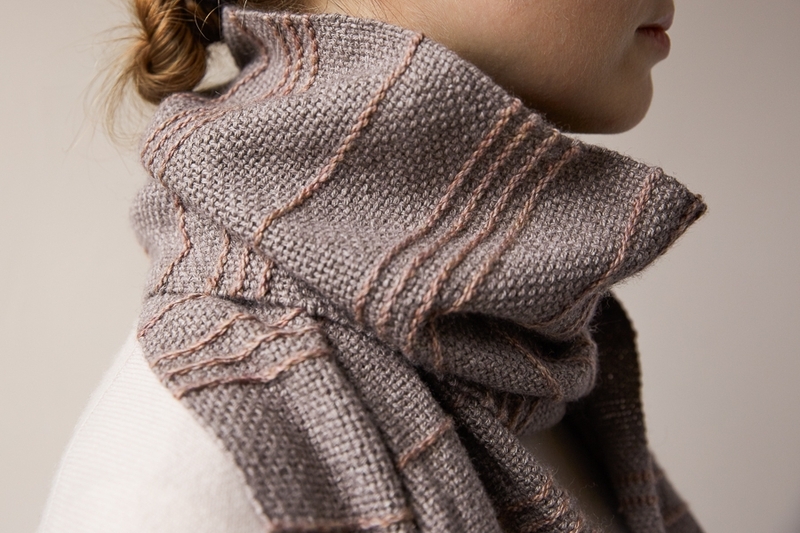 Designed for Purl Soho by Carrie Laing. 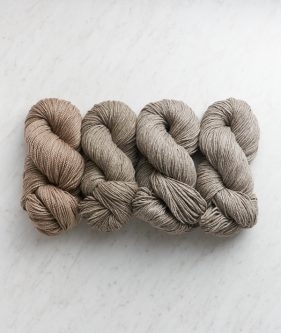 Warp Yarn + Weft Yarn A: 3 skeins of Purl Soho’s Understory, 50% baby alpaca, 25% baby yak, and 25% silk. Weft Yarn B: 1 skein of Purl Soho’s Mulberry Merino, 80% extra fine merino wool and 20% mulberry silk. 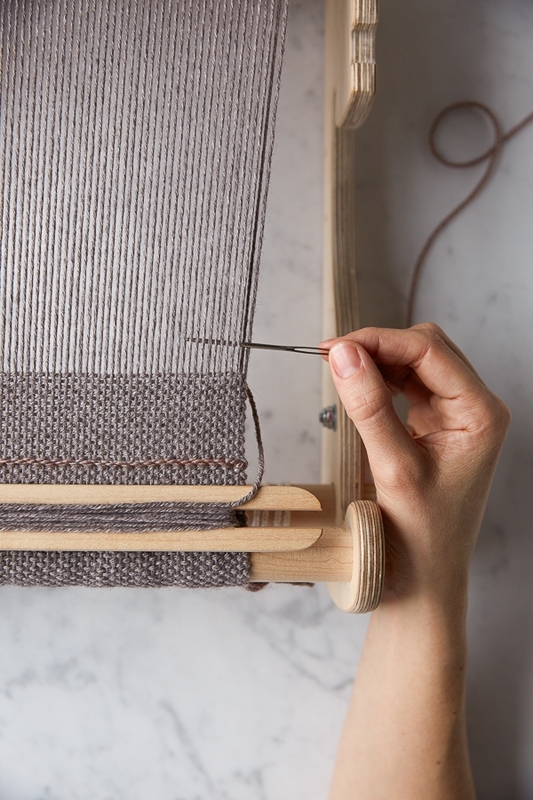 To begin, place the heddle in neutral position and thread a tapestry needle with approximately 30 inches of Weft Yarn B. Starting from the right and moving left, pass the threaded needle over the first 2 warp threads. Then moving right, bring the needle back under the first 2 warp threads. 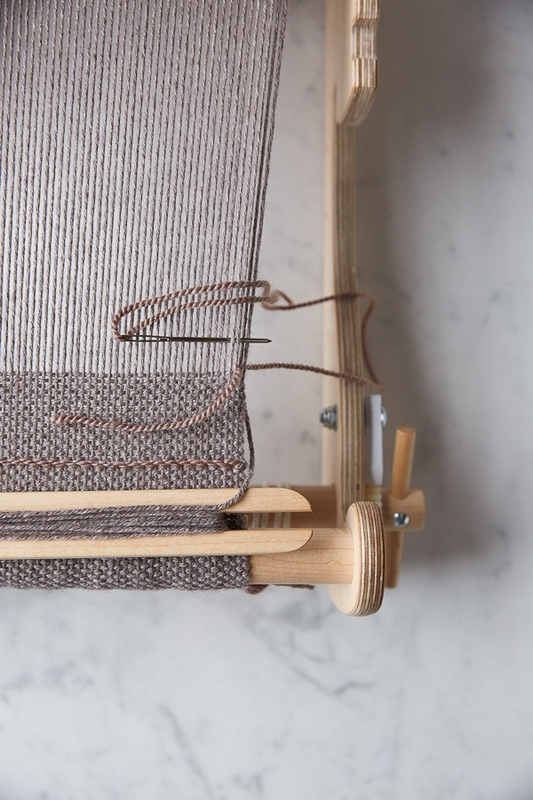 Pull the yarn through, leaving a 3-inch tail lying on top of the first 2 warp threads. … then moving right, back under the previous 2 warp threads, coming out above the warp and creating a loop. Pass the needle through the loop and pull tight. 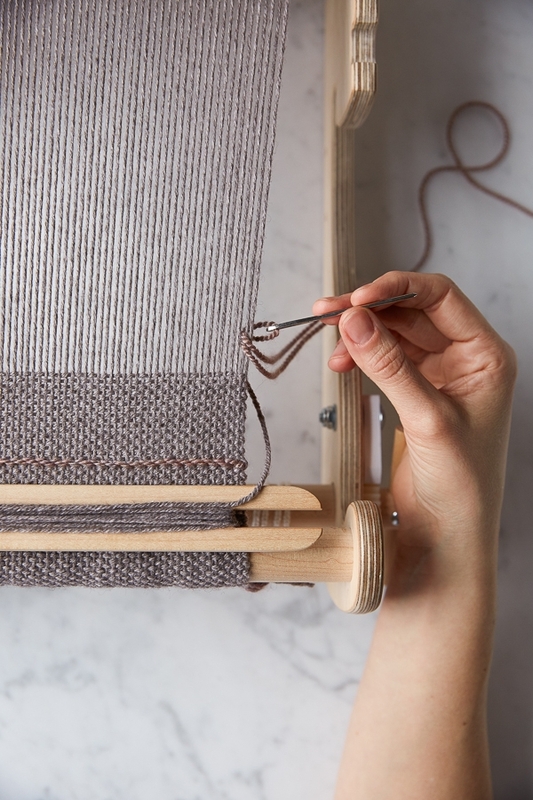 Repeat by passing the threaded needle over the next 4 warp threads to the left, then back under the previous 2 warp threads to the right, pulling the needle out above the warp threads and through the loop. Continue in this pattern across the width of your warp. Set up the warping peg 96 inches from the front of the loom. Tie one skein of the Warp Yarn to the back apron bar. 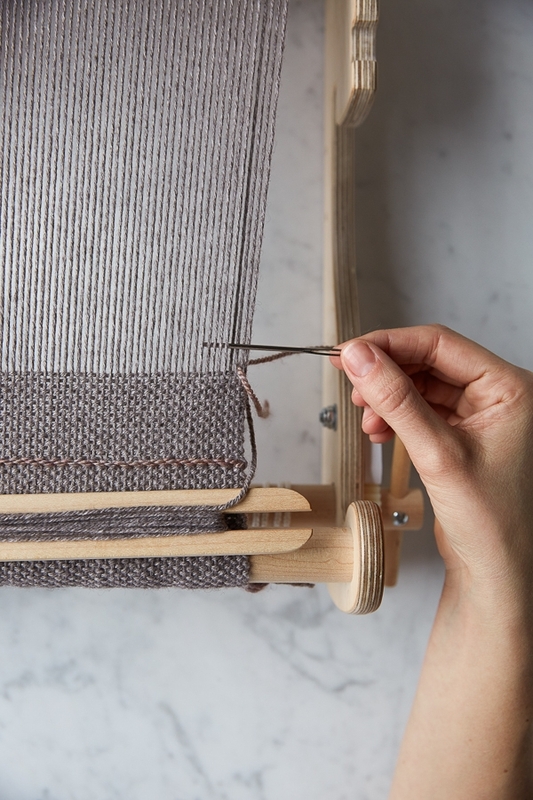 With a 8-dent reed in place, begin threading the heddle by pulling the first loop of yarn through the second slat from the right end of the reed. Working from right to left, thread the next 56 slats, so there are 57 slats threaded in total. Tie the yarn to the back apron bar. Wind on the warp using paper to separate the layers. Working from right to left, thread the yarn through each of the holes on the heddle. You should have a total of 114 warp threads. Tie the warp threads on to the front apron bar in groups of 6. 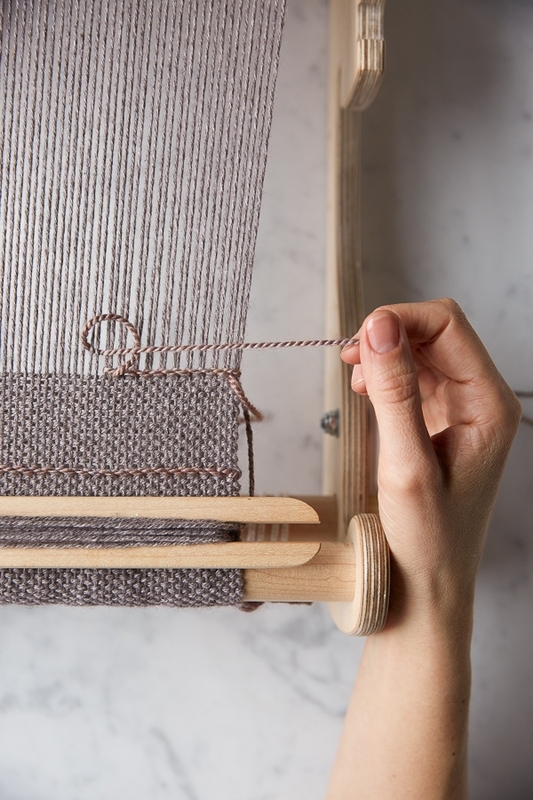 Wind a shuttle with Weft Yarn A. With scrap yarn, or using the Weft Yarn doubled, weave a couple of inches until the warp threads are evenly spread out. NOTE: When you pass the shuttle through the shed for the first row, leave a 36-inch tail, which you will use at the end for finishing. 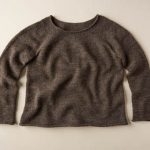 **With Weft Yarn A, weave in plain weave for 16 rows. With Weft Yarn B, weave a row of soumak weaving (see Notes, above). With Weft Yarn A, weave in plain weave for 20 rows. 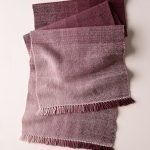 With Weft Yarn B, weave a row of soumak weaving. With Weft Yarn A, weave in plain weave for 4 rows. With Weft Yarn A, weave in plain weave for 10 rows. With Weft Yarn A, weave in plain weave for 26 rows. With Weft Yarn A, weave in plain weave for 7 rows. With Weft Yarn A, weave in plain weave for 14 rows. With Weft Yarn A, weave in plain weave for 3 rows. Repeat from ** 6 more times. With Weft Yarn A, weave in plain weave for 16 rows. 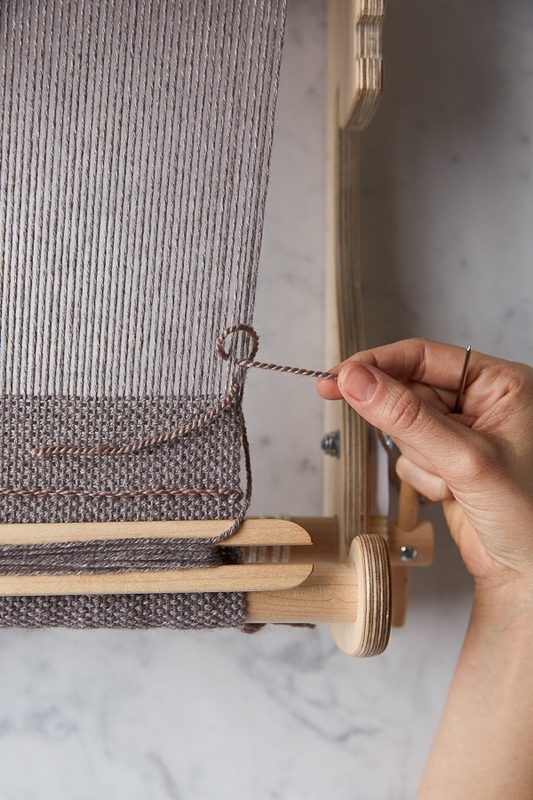 Leave a 36-inch tail of weft yarn for finishing. For a complete how-to on this step, visit our Finishing with Hemstitch Tutorial. 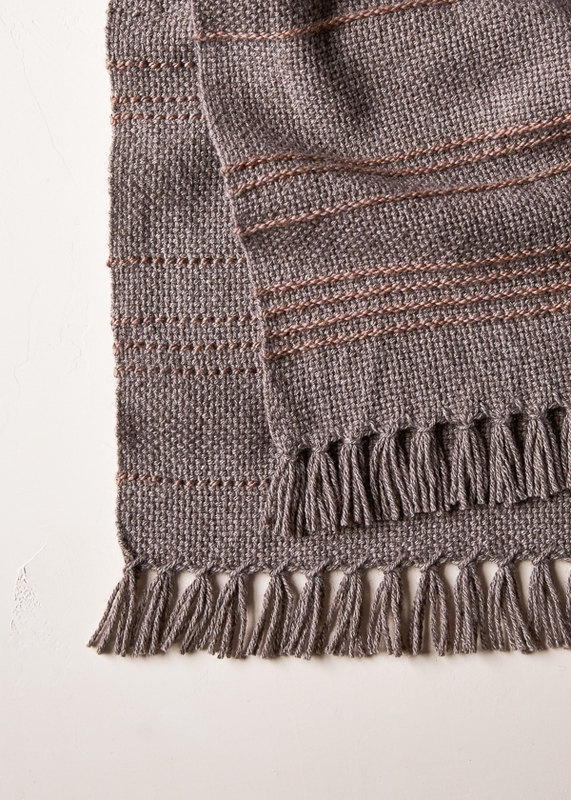 Use the 36-inch tails to finish each end of the scarf with a hemstitch. 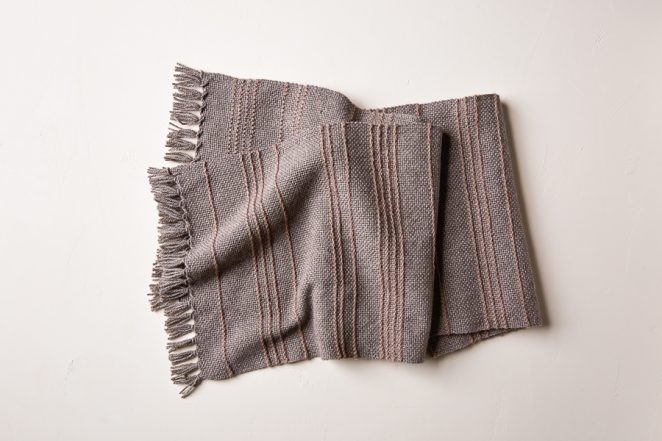 Make the hemstitch around groups of 6 warp ends across the width of the scarf. Cut the fringe 1/2 inch from the end of the weaving and weave in the hemstitch tails. Weave in the tails of each soumak row directly under the row, on the side of the scarf that wasn’t facing you as you were weaving. This will create a nice, neat row and make the tails practically invisible! 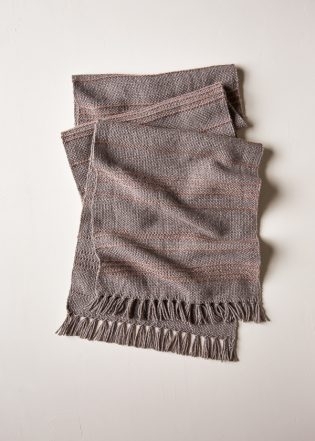 Gently hand wash your finished scarf in cold water, laying it flat to dry. Wow. Pretty. But looks like it would take forever. Is it tedious to do in the loom? Thank you for reaching out and for your kind words! This beautiful scarf will only be tedious if you find weaving to be tedious. 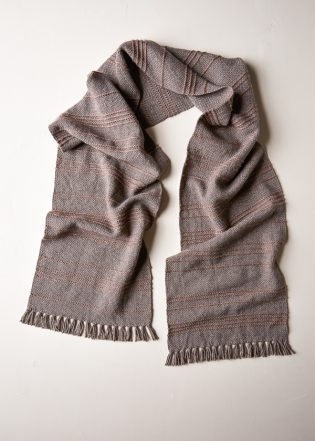 I wouldn’t say that it is going to take you longer to weave than any other woven scarf. If you are used to knitting, it will be much faster than knitting a scarf! Thank you for writing us! To unsubscribe to our newsletter all you need to do is click the “unsubscribe” button, which is located at the bottom of our newsletter. Lovely pattern w/ even lovelier yarn/color choices as always. 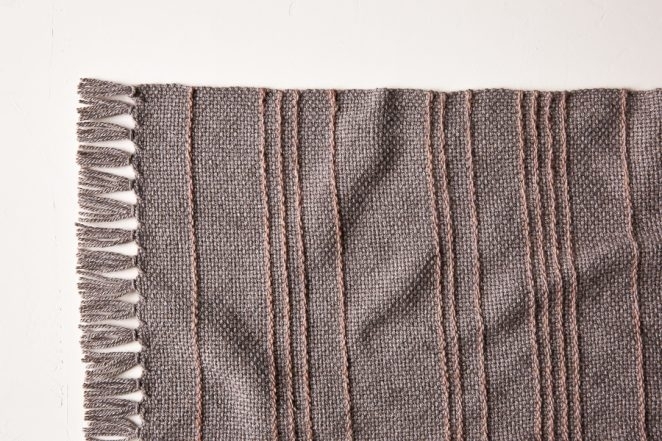 Question about the soumak rows–do the ends need to be woven in on each row or does the stitch secure the yarn enough that the tails can be snipped flush? Thanks for reaching out! You will need to weave in the end of the Soumak rows. Our weaver, wove them in after she finished the scarf and had it off of the loom but you can also do it as you go! 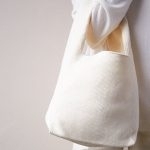 The ends can essentially be woven in underneath the soumak row on the back side, so that they don’t really show at all. That was my question too. 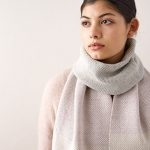 I love the look of this scarf but I hate to weave in. Beautiful piece. I just started it and am wondering if it should really only take 30 inches of weft yarn B for the spinal weave? It’s taking me closer to 60. Thanks for writing in! It’s hard to say what might be going awry without seeing your work, but our weaver did confirm she was able to work the spiral weave with 30 inches of Yarn B, as that is more than twice the width of the scarf. 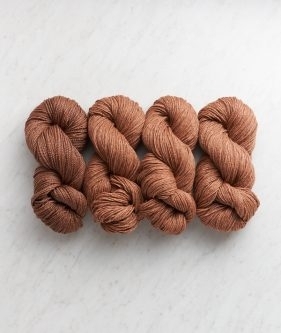 If you would like, you can send us a picture of your scarf at customerservice@purlsoho.com so we can try to troubleshoot this for you, but either way, you have more than enough Mulberry Merino in the bundle so you can cut the lengths however long you need without worrying about running out of yarn!